A Texas restaurant's decision to serve Attorney General Jeff Sessions, while the latter was in Houston to address law enforcement officials, has triggered rebuke and harassment from critics of the president's administration. 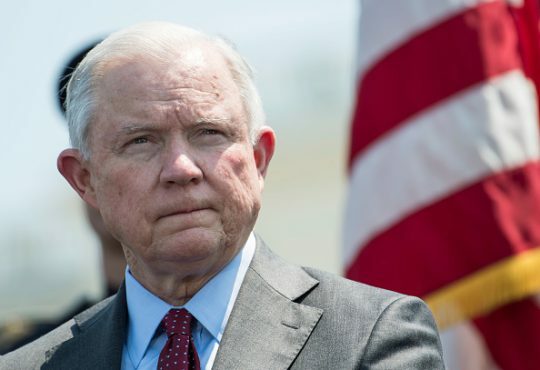 The attorney general was in Texas last week to outline strategies for combating gang violence, cross-border crime, and illegal immigration with federal prosecutors and law enforcement officials. As part of his trip, Sessions dined at El Tiempo Cantina, a Houston area Tex-Mex restaurant, Friday evening. 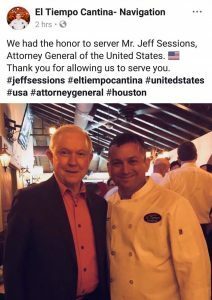 Shortly after the attorney general's visit, the restaurant posted a photo on Facebook of Sessions alongside Roland Laurenzo, El Tiempo Cantina's owner, stating the establishment was "honor[ed]" to have had a member of President Donald Trump's cabinet as one of its customers. "We had the honor to server[sic] Mr. Jeff Sessions, Attorney General of the United States," the restaurant wrote. "Thank you for allowing us to serve you." El Tiempo Cantina's post quickly triggered rebuke from local residents and progressives on social media opposed to the Trump administration's policies on immigration. One local resident, Gilma Aguirre, expressed to ABC affiliate KTRK-TV that she viewed El Tiempo Cantina's decision to serve Sessions as an insult to the "community" that "supports" and is employed by the restaurant. "I felt like it was a slap to the community that supports the restaurant and that backs up the restaurant and that works for the restaurant," Aguirre said. Within hours of Sessions' visit, the hashtag "BoycottElTiempo" was making waves throughout Twitter as progressives urged residents to shun the restaurant. Some even went to the added extent of urging those upset with the restaurant to share their "thoughts on El Tiempo's Facebook page." Jeff Sessions continues to target immigrants and enable Trump’s discriminatory policies yet @ElTiempoCantina is "Honored to serve him". The social media campaign against the restaurant has left an impact, according to reports, as numerous employees, including Laurenzo, have been subject to death threats and harassing behavior. In order to stymie the partisan furor, El Tiempo Cantina removed the photo of Laurenzo and Sessions, stating the post was made by the restaurant's social media without the approval of management. After removing the photo, the restaurant issued an official apology, asserting it did not agree with the political stances of the president. The apology, however, proved insufficient in ending the controversy. As of Sunday, El Tiempo Cantina had made the decision to deactivate all of its social media accounts. Laurenzo asserted the decision to go dark resulted from an unwillingness to deal with the insults being hurled in "such a dramatic fashion." "People are insulting us in such a dramatic fashion, and we feel like we don't deserve it," the owner said. "At least temporarily I had it taken down because I don't want to be insulted, my children to be insulted, my family to be insulted." This is not the first instance that a restaurant visit by a member of the president's cabinet has drawn controversy and consternation from the left. Earlier this year, White House press secretary Sarah Huckabee Sanders and her family were denied service at the Red Hen, a Lexington, Virginia restaurant. Sanders was asked to leave by the Red Hen's owner on the basis that she worked for an "inhumane and unethical" president. In the days prior to the incident at the Red Hen, two other Trump administration officials were accosted while attempting to dine at Washington, D.C. establishments. In June, Homeland Security Secretary Kirstjen Nielsen was angrily confronted while eating dinner by 15 protesters from the Metro D.C. chapter of Democratic Socialists of America. The secretary left the restaurant in response to the harassment and repeated shouts of "shame." Similarly, White House senior advisor Stephen Miller was accosted with shouts of "fascist" while dining at a Mexican restaurant. Neither Sessions nor the Department of Justice has commented on the situation that has embroiled El Tiempo Cantina. This entry was posted in Culture and tagged Jeff Sessions, Texas, Trump Administration. Bookmark the permalink.